The Ballina Motel in Napier enjoy's a fantastic central location. Located in a quiet, residential location conveniently positioned midway between Napier (8kms/10mins) and Hastings (12kms/15mins) city centres, and 10 mins from Hawke's Bay Airport. The Ballina Motel's close proximity to the Napier Hastings Expressway (3 minutes away) ensures easy access to all of Napier and Hawke's Bay's wide range of activities and attractions. Napier, the Art Deco Capital of the world, on the East Coast of the North Island of New Zealand. is one of the first places in the world to witness the dawn of a new day. Explore the many shops, restaurants and café's in Taradale. Enjoy an invigorating scenic walk to Dolbel or Otatara historic Pa scenic reserves. Jump on a bike and explore the cycleways (part of New Zealand's National Cycleways). Take an easy drive to Church Road Winery learning about the history of Hawke's Bay wine making. 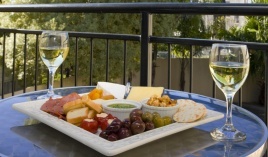 Experience Mission Estate Winery's internationally renowned restaurant. Taste Crossroads or Moana Park wines. Relax at wild roses café or the boutique Filter Room - Ale and Cider House. Play golf at Napier (Waiohiki) or Maraenui Golf Clubs. Relax at the Old Church Restaurant and Bar. Discover many other attractions in Napier, and the surrounding area. Staying at the Ballina Motel's central location gives you maximum convenience for your holiday or business trips. Leaving the airport turn right onto and proceed along the Napier Hastings Expressway following the signs towards Hastings, exit the expressway at the "Taradale Meeanee" off ramp and turn right onto Meeanee Road passing under the expressway, turn left at the Gloucester Street/Lee Road traffic lights (3rd set). The Ballina Motel is just 300 metres away on the right. Coming to Napier from Taupo (approx 1.5 hours) or Gisborne (3.5 hours). After passing the Hawke's Bay Airport proceed along the Napier/Hastings Expressway following the signs to Hastings, exit the expressway at the "Taradale Meeanee" off ramp and turn right onto Meeanee Road passing under the expressway, turn left at the Gloucester Street/Lee Road traffic lights (3rd set). The Ballina Motel is just 300 metres away on the right. Travelling north on SH 2, approximately 25kms north of Dannevirke (Signposted "Tikokino" and "Onga Onga") turn left onto SH 50 and follow the signs to Napier (two left hand turns). Proceed straight through the middle of the Napier Golf Course, and after crossing the Tutaekuri River Bridge and entering Napier the Ballina Motel is 1km on your left. This short-cut will save you about 10/15 minutes driving time. Travelling north along the Napier/Hastings Expressway following the signs to Napier, after crossing the Tutaekuri River Bridge exit the expressway at the "Taradale Meeanee" off ramp and turn left onto Meeanee Road, turn left at the Gloucester Street/Lee Road traffic lights (3rd set). The Ballina Motel is just 300 metres away on the right. Leaving the city via Tennyson Street and travel out until you reach Kennedy Road. Proceed along Kennedy Road, Gloucester Street, Lee Road and straight through the Meeanee/Puketapu Road traffic lights into the second half of Gloucester Street. The Ballina Motel is just 300 metres away on the right. Ballina Motel GPS Coordinates are 39:32:23 South - 176:50:47 East.